With the season still a few weeks away and nothing but a series of fairly meaningless friendlies taking place the only other stories dominating the headlines are the transfer stories so here is a brief summary of the comings and goings and the rumours that have been doing the rounds in Argentina over the last couple of weeks. Boca Juniors have been busy with the signings of Juan Manuel Martinez from Corinthians, Claudio Perez from Belgrano and Ribair Rodriguez from Siena. They will be hoping that the front pairing of Martinez and current centre forward Santiago Silva can be as successful as they were playing together at Velez when they won the Clasura in 2011. Two former players talking about returning to La Bombonera are Carlos Tevez and Fernando Gago. Tevez has reiterated that when his current deal expires at Manchester City in 2014 he will be looking to return to Boca. We’ll see if Carlos really wants to walk away from all the money next summer but I have my doubts. 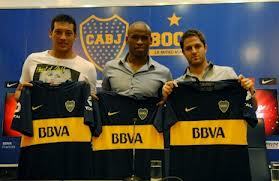 The other player is Fernando Gago who interested Boca until he apparently asked for an 8 year deal. And speaking of money hungry ex-Boca players Juan Roman Riquelme has been the subject of intense speculation after deciding against continuing to play with Boca it looked as though Brazilian side Palmerias has offered him a lifeline (a very lucrative lifeline I would imagine). However, they have been unable to agree on a deal so this looks like it may be a no go. 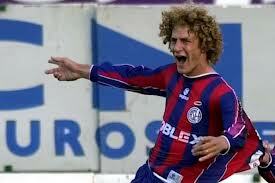 Coloccini in action for San Lorenzo but will he return? One of the transfer stories which has rumbled on over the last few weeks has been the protracted transfer of Newcastle captain Fabricio Coloccini to San Lorenzo. San Lorenzo made it very public knowledge that Coloccini was their number one target but curiously did not have the money to buy him. Over the coming weeks Coloccini’s father, a member of the San Lorenzo youth set up said that his son was keen to move back to Argentina for personal reasons. As it stands Newcastle have denied Coloccini that move (rightly so,as he is under contract) and now we are left with the rumour that Coloccini will walk out on Newcastle and return to Argentina regardless. In the meantime San Lorenzo have signed their ´back up´option Mauro Cetto from Palermo. A striker who was created a lot of interest is Dorlan Pabon, the Colombian currently playing for Parma. Independiente, Racing and San Lorenzo were all supposedly keen and for a while this story seemed like it may lead somewhere but for now his agent has said that he will stay in Europe. Another member of Argentina’s under 20 team involved in some transfer news is Juan Iturbe whose supposed move from Porto to River has had some hitches as the clubs disagree over his value so for the time being is on hold. And an Argentine player not currently playing here in Argentina but attracting interest from Manchester United nonetheless is Ezequiel Garay who United view as a long term successor to Rio Ferdinand. However, their valuation is currently significantly lower than Benfica. If you can think of anything else then please let me know! Also follow Golazo Argentino on twitter and facebook to get up to date information!